I just got an email from the organizers of Haute Route detailing what they know about next year’s new addition – Haute Route Dolomites / Swiss Alps. Well, not exactly ‘detailing’. More like exactly what I’ve put in those 5 words in the last sentence. We know that the route will start in a ‘major city’ and finish ‘on the shores of Lake Geneva’, that’s about it. But really, isn’t that enough when you know for sure you’ll be climbing up roads like this? Registrations are open for previous participants of Haute Route…and they close soon. Somebody talk some sense into me. 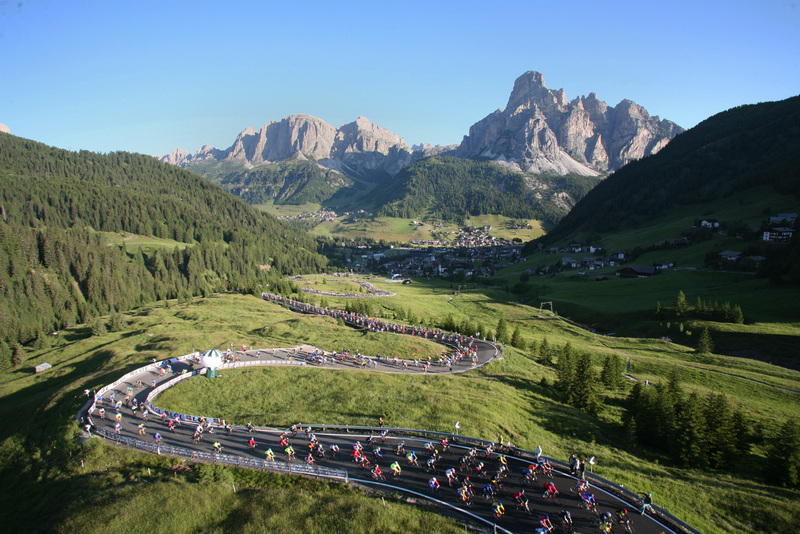 This entry was posted in Cycling and tagged haute route 2014 dolomites. Bookmark the permalink. Sounds like a blast. I’m sticking with the Alps version, but might see you at the finish line if nobody talks you out of it. Right, there’s supposed to be a meeting of two HRs at the end of the Dolomites / beginning of Alps. Would be good to finally meet. Thanks. I think I might. Unless of course, it turns out not be sufficiently challenging. Send your money now. Does that make sense? It does. I don’t want to, but it does. As usual, I’m with Tootlepedal, but I’ll rephrase it as: Ride! Can you imagine what you would run as a theme in your head if you don’t??!? Your goal is to finish in the top 100 with a new bike? I don’t know which one would be more challenging; affording a new bike (with power meter, of course) or finishing top 100! Too much for me! I like going at my own pace, take in the scenery, take a few photos, have decent meals with plenty to drink… Just a tourist, really. I remember when I was like you. You will change. How does it go…’resistance is futile’! Any takers from the 2013 Haute Route Alps team? I’m very tempted. Did you try the registration link? It wouldn’t let me in. We’re sort of having that discussion on the FB Group. Mark is very keen and there are others ‘in negotiations’ at the moment. Some are on the fence, I imagine, too. I just got into the 2nd page of the registration, by the way. Haven’t gone further than that. Don’t want to go too far! Which one would you be thinking about, by the way? I’m giving too much consideration to doing one of the HR routes and have, so far at least, managed to be held back by a mix of my conscience, self-doubt and procrastinating cycling brethren. It seems to be me you have neither of these issues Gerry so go and click the “Sign me up – where do I pay” button immediately! Also, I hear its one of cycling’s unwritten rules that you need a new bike per year/per route for the HR – so you absolutely have to have that new frame too. After all, the correct number of bikes to own is n+1 where n is the number of bikes already owned and you can’t argue with the maths or the rules! Marcus, you’re killing me! My latest thinking is no Haute Route and no bike. I must now revisit those rules!